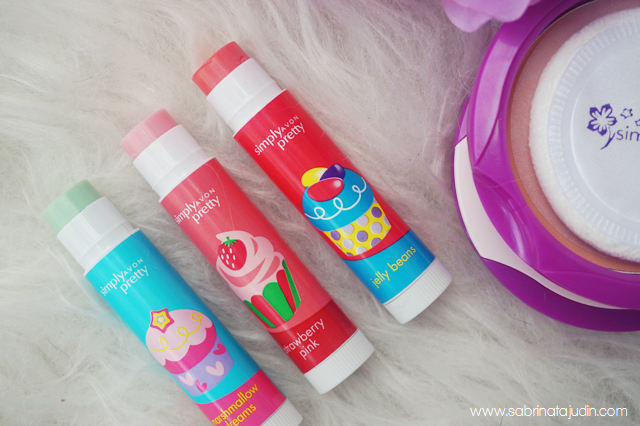 Here is the second AVON Simply Pretty Collection and it is called... Gwiyomi! Oh don't get me started. haha. From my first post you know that I told you about these variants collection from AVON Simply Pretty range. This is the second one. It is describe as a flawless skin and moisturized lips with semi-matte color that last for hours. A great look for your weekend and shopping session. In this collection it consist of a compact powder with 3 different shades, 3 adorable lip balms & 8 beautiful semi matte lipsticks. 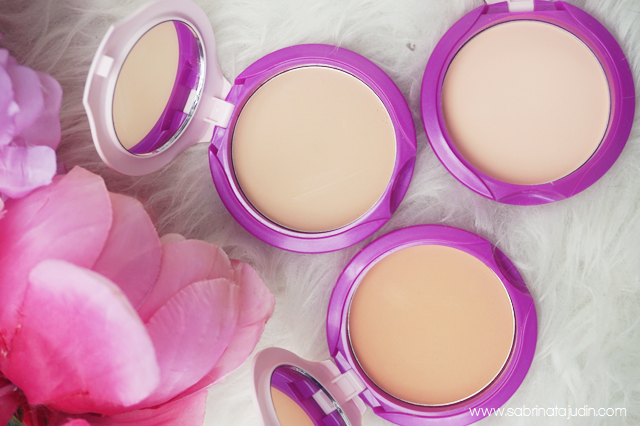 The first one is this Shine No More Pressed Powder that comes with SPF14. I could say I am impressed with the color selection. From a really bright shade to a medium shade. It said to be a powder that helps to keep your face fresh and blemish free. This compact comes with a mirror and a puff applicator. These lim balm I tell youu... smells so good and yummy just like the packaging it self. It has 3 variants which are Marshmallow Dreams, Strawberry Pink & Jellybeans. Just like any other normal chapstick, this helps to moisturize your lips amazingly good with its yummy scent and tint of color. 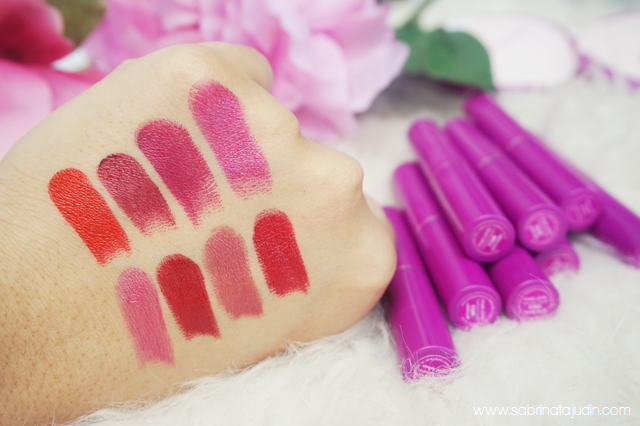 The most exciting product in this collection gotta be these lipsticks. Kinda reminds me of Urban Decay lipsticks at a glance. It is the Avon Simply Prety ColorLast Lipstick. It consist of 8 semi matte shades and they are amazingly opaque and creamy. I am not even joking. 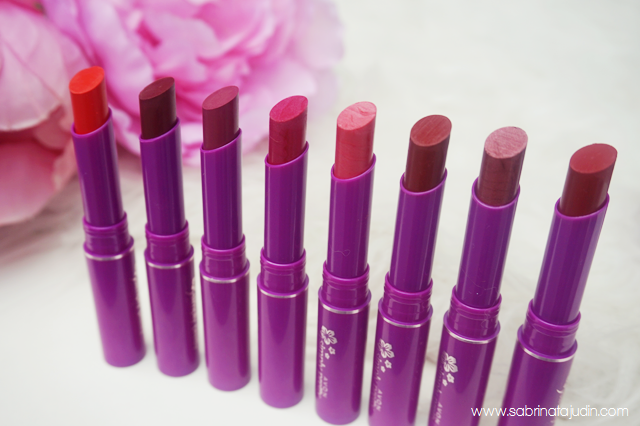 They are very creamy and they have such a true color to what you see on each lipstick. Celebrity Red CL01 - A true red with orange undertone. Burgundy Dream CL02 - A dark red maroon shade with a brown undertone. Sweet Strawberry CL04 - Dark rapsberry pink with pink undertone. Mauve Delight CL08 - Dark Pink with burgundy undertone. A bit pearly to the finish. Peachy Pink CL10 - A milk pink with peach pearl finsih. Always Burgundy CL13 - Dark brown with red undertone. Forever Rose CL14 - Pearly to metallic pink with dark red undertone. Wow, I am definitely going to give those lipsticks a try! By the way, how much do they cost? I would love to see your makeup collection/vanity tour video on YouTube Sabrina! The colors of the lipsticks are just Wowwww!!! mmg! i pun like wow masa watch, this is so pigmented! nice blog., very useful.. thank you!